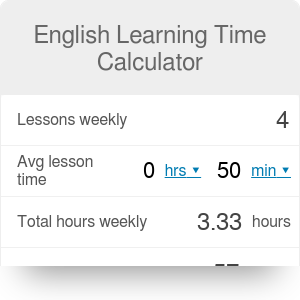 English learning time calculator evaluates time needed to reach particular levels of English language. If you were ever wondering what's the average time needed to learn English at particular level, our tool should come handy. In this calculator we use English language levels as per Common European Framework of Reference for Languages, ranging from A1 (beginner) up until C2 (proficient) along with the respective certificates' names. English Learning Time can be embedded on your website to enrich the content you wrote and make it easier for your visitors to understand your message.